This blog post was first published on September 6 2011, and revised and updated on September 24 2015. On August 7 2011, Australia’s most decorated servicewoman of World War II died. 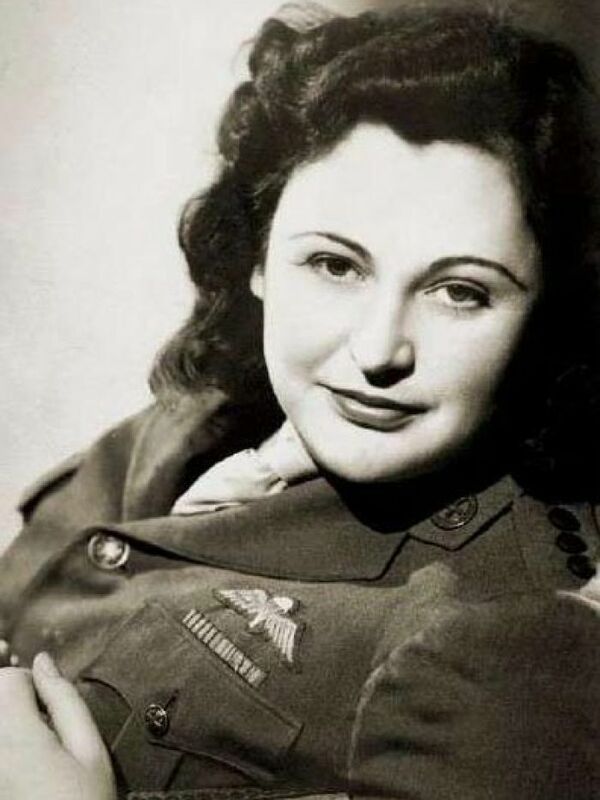 Nancy Wake was born in New Zealand in 1912, and her family moved to Australia when she was a baby. Not long after, her father abandoned the family and went back to New Zealand, selling their house in the process, thus leaving his wife and six children homeless and destitute. Life must have been tough for young Nancy, but she was clearly a born survivor. A girl of spirit, she ran away from home at the age of 16 and worked as a nurse. When an aunt left her a £200 inheritance, she travelled to New York, and then London, where she became a journalist. During the 1930s, she settled in Paris, and worked for the Hearst newspapers as European correspondent. One of her first assignments was to interview Adolf Hitler. She also witnessed first-hand the brutal persecution of Jews by the Nazis in Vienna, and vowed that if she could ever do something about it, she would. In 1939 Nancy married Henri Fiocca, a handsome and wealthy French industrialist who she described as the love of her life. Six months later, Germany invaded France, and Henri and Nancy both joined the French Resistance. Nancy worked as a courier, smuggling food and messages to Resistance agents in Spain, and was able to assist more than a thousand escaped prisoners of war and Allied fliers out of France. By 1942, the Gestapo had become aware of a significant Resistance agent who was proving a thorn in their side, and code-named her The White Mouse. She was #1 on the Gestapo’s “Most Wanted” list, and had a 5 million franc bounty on her head. Nancy escaped to England, where she trained as a spy in the French section of the British Special Operations Executive, who worked with local resistance groups in German-occupied territories. She parachuted back into France in 1944 to help with D-Day preparations, and after D-Day was in charge of an army involved in combat against German troops. Never one to back down from a hard task, she once cycled 500 km in three days, crossing several German checkpoints, to find an operator to radio Britain and request new radio codes. Attractive, vivacious and feisty, she drew admiration for being an “Australian bombshell” who was a crack shot with a cheerfully never-say-die attitude. One of her comrades, Henri Tardivat, said of her: She is the most feminine woman I know, until the fighting starts. Then she is like five men. At the end of the war, Nancy discovered that her beloved husband Henri had been captured, tortured and executed by the Gestapo in 1943 for refusing to disclose her location. She never ceased to regret leaving France, and blamed herself for his death, believing that if she had stayed with him, he would have survived. After the war, she was showered in international honours, including the George Medal, the Croix de Guerre, the Medaille de la Resistance, the Chevalier de Legion d’Honneur, and the US Medal of Freedom. Further honours came to her throughout her life, but none from Australia for many years. At first she refused all Australian recognition, then there was some bureaucratic tangles because technically Nancy was still a citizen of New Zealand. Nancy probably didn’t help the process by getting unsuccessfully involved in Australian politics, and by telling them to stick their medals somewhere unmentionable. Rather belatedly, she was awarded the Companion Order of Australia in 2004; by that time she had left Australia permanently to live in London, after being widowed once more (this time after 40 years of marriage). Nancy died three weeks away from her 99th birthday. On March 10 2013, her ashes were taken to the village of Verneix near Montluçon, in central France – the region she had used as her base while a Resistance fighter. Here the ashes were scattered in a private ceremony attended by close friends, in accordance with her wishes. She said of herself: I hate wars and violence, but if they come, I don’t see why we women should just wave our men a proud goodbye and then knit them balaclavas. Nancy was originally a short form of Annis, the medieval English form of Agnes, and in use since the Middle Ages. However, by the time Nancy became commonly used as an independent name in the 18th century, it was derived from Nan, a short form of Ann or Anne. There are many famous namesakes for this name. Anne “Nancy” Regan, former US First Lady; Nancy Astor, the first female MP in the British Parliament; boot-stomping singer Nancy Sinatra; witty author Nancy Mitford; voice actress of Bart Simpson, Nancy Cartright; punk lover Nancy Spungen; nobbled skater Nancy Kerrigan. It’s interesting how often famous Nancys end up being controversial in some way. Fictional Nancys are just as strong characters as their real world counterparts. Smart girl detective Nancy Drew, an inspiration to powerful women such as Hilary Clinton. Piratical tomboy Nancy Blackett from Swallows and Amazons; her real name is Ruth, but pirates must be ruthless! Dreamworld heroine Nancy Thompson, who takes on the nightmarish Freddy Kruger. Poor degraded Nancy from Oliver Twist, who performs a noble act to save another, though it risks her own life. Nancy is a classic name which has been almost continuously on the charts. It was #114 in the 1900s, joined the Top 100 the following decade, and peaked in the 1920s at #26. It left the Top 100 in the 1950s and has fallen gradually; currently it is around the 500s. In the United States, Nancy was a Top 100 name in the late 19th century, and then again from the 1920s to the end of the 1970s – a very good run. It is has fallen steadily since then and is now #752. In the UK, Nancy was on the top 100 from the mid-19th century until World War II. In 1996 it was #251, and generally making upward progress. It joined the Top 100 again last year, and is currently #90. UK Prime Minister David Cameron has a daughter named Nancy, born in 2004. Nancy is a wholesome yet spunky name which faded too quickly in Australia compared to other countries. It fits in perfectly with the current trend for cute short form names such as Maggie and Kitty, while having a clean classic feel. This is a spirited choice, suitable for those who want their daughters to be in the thick of the fight, not just waving and knitting on the sidelines. Nancy received an approval rating of 56%. 30% of people thought the name was too dated and old-fashioned, but 16% said it was sweet and wholesome. Nobody was affected by the “nasty Nancy” label given to Nancy Spungen, but 6% were concerned about the phrase “negative Nancy”, and 4% were really bothered that “nancy” is slang for a homosexual or effeminate man. Wow. The only Nancy I knew was Nancy Drew. This is fantastic. I’ve always loved the name Nancy; David Cameron has one about 7ish years old and thus proves it makes for a great name for a little one. What an amazing woman. Truly a great namesake. I actually do know a little Nancy. She’s about three or four.